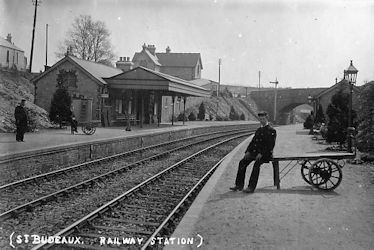 Saint Budeaux for Saltash Station in LSWR days. Note the covered walkway to the Down platform on the right. 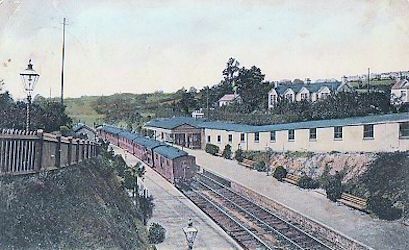 Unlike its rival, the Great Western Railway Company, the London and South Western Railway Company provided the village of Saint Budeaux with a proper railway station right from the start. Known then as Saint Budeaux for Saltash Station, it opened to the public on Monday June 2nd 1890. 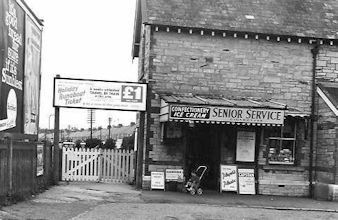 It had a signal box controlling the entrance to a goods yard. An LSWR Up train waiting at Saint Budeaux for Saltash Station. Note the station name board. On Wednesday September 26th 1906 the LSWR inaugurated its new suburban service between Devonport Station and Saint Budeaux. There were eighteen trains in each direction on weekdays and eight on Sundays. The first car left Devonport Station and 6.18am, returning from Saint Budeaux at 6.40am. The last car left Devonport Station at 10.30pm and Saint Budeaux at 11.10pm. On Sundays the service would start at 9.08am from Devonport and 9.27am from Saint Budeaux and continue until the last train left Devonport at 10.08pm and Saint Budeaux at 10.25pm. The fare from Devonport to Camel's Head was one penny and to Weston Mill and Saint Budeaux, two pence. All trains called at Ford Station. From Monday October 1st 1906 this service was extended in to Friary Station. The LSWR staff pose for a picture at Saint Budeaux for Saltash Station. Note that the main buildings were on the Down side. 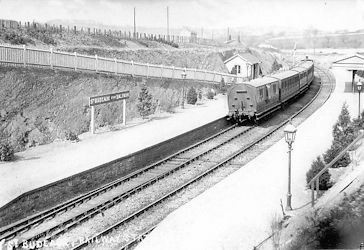 Following the nationalisation of the railway network as British Railways on Thursday January 1st 1948, the Station was renamed Saint Budeaux Victoria Road from Monday September 26th 1949 to distinguish it from the former Great Western Railway stopping place in Ferry Road. from Saint Budeaux Square, 1960. According to the "The Official Hand-book of Station 1956" Saint Budeaux Victoria Road Station dealt with goods traffic, passengers, parcels, miscellaneous traffic, furniture vans, carriages, motor cars, portable engines and machines on wheels, live stock, horse boxes, prize cattle vans, and carriages and motor cars by passenger or parcels trains. It was equipped with a crane capable of lifting 1 ton 10 hundredweight (cwt). Goods traffic ceased as from Monday December 11th 1961 and it was renamed Saint Budeaux Halt and became unstaffed as from Sunday July 18th 1965. It became simply Saint Budeaux as from Monday May 5th 1969. Saint Budeaux Victoria Road Station is still open, denuded of all its previous facilities, but is served only by the services on the Bere Alston and Gunnislake Branch.